“The Company” shall mean Samsian Ltd.
“The Customer” shall mean the person or organisation who instructed the works or for whom the Company agrees to carry out works. “The Operative” or “Engineer” shall mean the representative appointed by the Company. “Instruction” shall mean an order given to the Company by the Customer to carry out works whether verbal or written. “Work” or “works” shall mean any activity carried out at the customers premises or property visited by the the operative or engineer. “Advice” shall mean any information or recommendation provided by the Company or Engineer to the customer whether written or verbal. The Company reserves the right to refuse or decline work at its discretion. Where the Company agrees to carry out works for the Customer those works shall be undertaken by the designated operative of Company at its absolute discretion. 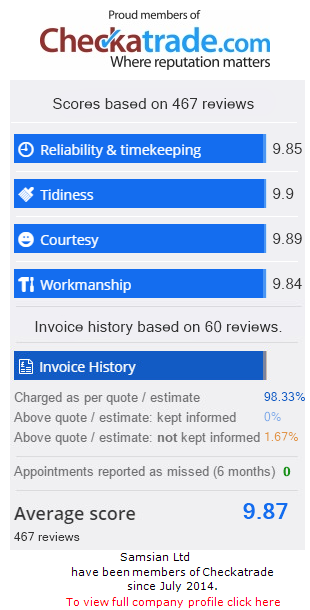 The total charge to the Customer shall be as quoted or consist of the cost of materials supplied by the Company plus mark up & the amount of time spent by the operative in carrying out works (including all reasonable time spent in obtaining non-stocked materials) charged in accordance with the Company’s current hourly rates for that area. Invoices are due for payment immediately upon completion or delivery to the Customer or as terms set out on account invoices. Any part of that invoice which remains unpaid shall carry interest at the rate of 3% over the base rate until payment in full is received by the Company. if after submission of the estimate the Customer instructs the Company (whether verbally or in writing) to carry out additional works not referred to in the estimate. if after submission of the estimate there is an increase in the price of materials or third party services. if after submission of the estimate it is discovered that further works need to be carried out which were not anticipated or identified when the estimate was prepared. if after submission of the estimate it is discovered that there was an error when the estimate was prepared. The Company shall not be under any obligation to provide an estimate to the Customer & shall only be bound (subject as hereinafter) by estimates given in writing to the Customer & signed by an authorised representative of the Company. The Company shall not be bound by any estimates given verbally or where errors occur. The Customer must be informed wherever possible. Where the date & or time for works to be carried out is agreed by the Company with the Customer, then the Company shall use its best endeavours to ensure the operative attends on the date & at the time agreed. However, the Company accepts no liability in respect of the non attendance or late attendance of the operative/engineer or for the late or non delivery of materials. The Customer shall accept sole liability to discharge the Company’s account unless he/she discloses to the Company in writing at the time of initially instructing the Company to carry out work that he/she is acting on behalf of a third party. If the Customer cancels their instructions prior to any work being carried out then the Customer shall be liable for any related expenditure together with the profit that would have been made by the Company had the work been carried out in accordance with such instructions. If, after the Company shall have carried out the works, the Customer is not wholly satisfied with the works then the Customer shall give notice in writing within 7 days to the Company & shall afford the Company, and its insurers, the opportunity of both inspecting such works, & carrying out any necessary remedial works if appropriate. The Customer accepts that if he fails to notify the Company as aforesaid then the Company shall not be liable in respect of any defects in the works carried out. Materials supplied by the Company will be guaranteed by the Company for a period of 6 months from the date of installation by the Company. Replacing faulty materials after that date will be charged for in accordance with the Company’s current hourly rates for that area plus the cost of replacement parts to include the company’s standard mark up in force at that time. The Customer accepts sole liability for claims against manufacturers where those manufacturers guarantees exceed the Company’s guarantee. The company will not guarantee any work in respect of breakdowns, leaks or blockages in heating systems or appliances that is due to scale or sludge, other contamination, misuse, negligence or faults existing prior to work carried out by the company. The company will not guarantee any work undertaken on instruction from the customer & against the written or verbal advice of the operative/engineer or where an operative/engineer has not diagnosed the work as being required. Work is guaranteed only in respect of work directly undertaken by the company & where payment in full has been made. Any non-related faults arising from recommended work which has not been undertaken by the company will not be guaranteed. The company shall not be held liable or responsible for any damage or defect resulting from work not fully guaranteed or where recommended work has not been carried out or where an operative/engineer has not diagnosed the work as being required. Work will not carry a guarantee where the customer has been notified by the operative either verbally or indicated in ticked boxes or in Comments/ Recommendations of any other related work which requires attention. The customer shall be solely liable for any hazardous situation in respect of Gas Safety (Installation and Use) Regulations 1998 or Gas Warning Notice issued. These terms & conditions may not be released, discharged, supplemented, interpreted, varied or modified in any manner except by an instrument in writing signed by an authorised representative of the Company & by the Customer. Further, these terms & conditions shall prevail over any terms & conditions used by the Customer or contained or set out or referred to in any documentation sent by the Customer to the Company; by entering into a contact with the Company the Customer agrees irrevocably to waive the application of any such terms & conditions. Unless otherwise stated a fixed processing charge of 3% will be added to all total payments where payment is made by credit card. This will be clearly identified on our engineers report or invoice. The Company & shall not be held responsible for ensuing damage or claims resulting from advice given to the customer or for works carried out by others following advice. Unless otherwise stated, all prices, quotes, estimates given shall exclude VAT at the prevailing rate in force. The Customer is deemed to have read & accepted the terms and conditions herein at the time of giving instruction to the Company. Had my boiler serviced. Dan was very professional and polite, work was carried out efficiently and no mess was left. I would definitely recommend this company to my friends and family.